Smart Place Paris Gare du Nord by Hiphophostels i Paris, Frankrike : Boka nu! Kryssa för rutan för att visa att du har läst och förstått villkoren. Du måste godkänna våra villkor för att bekräfta din bokning. Jag bekräftar att jag har läst och förstått ovanstående gruppbokningsvillkor som beskrivs här på svenska. Boka mer än 7 dagar i förväg för kostnadsfri avbokning. Welcome to Smart Place Paris Hostel & Budget Hotel! Located a few steps away from the Gare du Nord station, the Smart Place is the most conveniently located hostel in Paris. 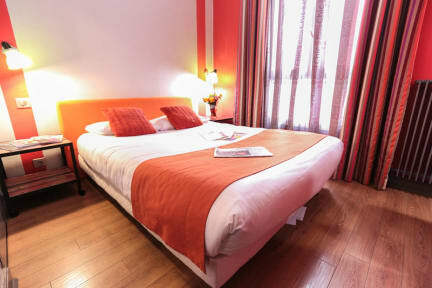 This hostel is near the district of Montmartre, its animation and exciting ambiance and its old Paris charm. Next to the Rue Maubeuge, you'll be impressed and surprised by the commercials streets,with the baker, the cheese dairy and the butcher... Quaint and intimate, Smart Place provides guests easy access to great local restaurants and bars and all the attractions Paris has to offer. Smart Place Paris offers free WiFi, free luggage storage and a kitchen for guest use. 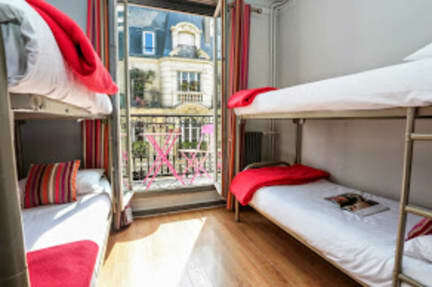 The hostel is a locally owned hostel that is proud to deliver its guests a friendly and comfortable experience in Paris. In the Smart Place you will have plenty of types of rooms, you'll just have to choose. There is for example the private double room with the comfort of an hotel but with the warmth and friendliness of our hostel. You can get a yummy parisian breakfast for 4€ per day and per person! With a 24/7 multilingual staff, Smart Place easily serves all the needs of individual travelers or groups.